The word “breeding” may come along with the words “patience and consistency” especially when it comes fancy pigeon breeds. With that, we may consider breeders around the world as one of the patient and consistent individuals. Although there are hundreds of fancy pigeon breeds, we can name some that are very popular with the breeders. Such are: Modena, Runts, Pouters, King, Strasser, Tumblers, Indian Fantails, Fantails, Maltese, Swallow, Spanish Figurita, Jacobin, Frillback, Nuns, Lahore, Barb, Archangels, Polish Lyn, French Mondain and Flaygyze. 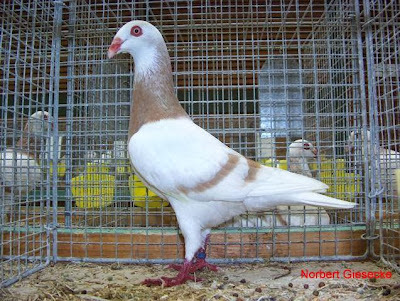 Modena – pigeon breed that has more than 150 color patterns. Spanish Figurita – smallest breed of pigeon. Maltase – largest breed of pigeon. Breeders observe also that there certain breed of pigeons that are inconsistent when it comes to raising their chicks. But there are also some that are stable pairs. But generally, pigeons are very reliable parents. Other than these common breeds, there are still thousands of sub breeds that can be found. Different breed of pigeons carry different attitudes and qualities. With that number, breeders can do a lot of fancy pigeon breeds. Food – regardless of the breeding procedure used by the breeders, pigeon foods are one of the basic things that must NEVER be taken for granted. Cage – Pigeons must be safe and secured in their cage because they are sensitive birds. One reason why plastic cage is not recommended because they stop fresh air from coming and circulating. Those are two topmost requirements but the following items must not be taken easily as well: drinking water, grit, nesting material and nest bowl. Keeping these basic necessities at hand is very essential when it comes to fancy pigeon breeds. Different breeders have different opinions when it comes to what system of breeding is more effective than the other. What we can do is compare and contrast both methods and let the flock owners decide which one would be best applied on their birds. Increase of egg hatchability and decrease in egg breaks. There is no interference of other pairs. Breeder has more control in producing specific colors of their choice. Parent pigeons can provide more feeds to their chicks that contribute to their growth. Breeders don’t have to worry about fighting and jealousy between the other breeding pairs. Outbreak of viral infection is reduced and can be controlled. Since breeders need to keep one pair in one cage, it would be a costly system. Time consuming and more work is required. Breeders need spacious breeding area. Dead in shell is common during hot weather conditions. Inexpensive system because breeders can keep more than one pair in a single cage. Less work and time is required when it comes to feeding the pigeons since they are in one cage. Less work and time is required when it comes to giving medicines to the flock. In some instances, female pigeons continue to lay eggs when paired or married with other male pigeons. There is a number of egg breaks and decreased in egg hatchability because of interference of other pairs. Breeders have no control of specific colors to be produced. Parent pigeons have less attention on their chicks therefore chicks are not fed well. A lot of fighting and jealousy may occur between the pairs. There are instances of voluntary divorces although they have made a strong pairing bond. In case of viral infection, outbreak my happen fast. Pigeon owners may choose from these fancy pigeon breeds procedures based on the given pros and cons above. Colony breeding and single pair breeding are two different methodologies therefore pigeon owners must be reminded of important things for each system. Use a cage that is made of iron. Although it is not a breeding season, male pigeon must not be separated from the female pigeon. Cage dimension could be at least: Length- 2 feet; Width- 3 feet; Depth- 2 feet. Cage must be secured from pigeon enemies like snakes, dogs, cats and hawks. Don’t include old male nor old female pigeons. Attach one pen to the cage where pigeons are free to fly, bath as well as sun bath. Put green cloth in hot weather conditions. Put heavy clothing during winter seasons since they are very sensitive in dampness. Breeding pairs must not be disturbed unnecessarily because they do need privacy. Both for colony breeding and single pair breeding, it is important to remember that sunlight is an essential thing for pigeons. Early morning sunlight gives them strength. Breeders may adjust their cage according to sun’s movement. Another essential tip to remember is that pigeons do get stressed up and as a result, they stop eating. One reason for that is they were separated from their parents too early. It is recommended to have them stay with their parents for a month before taking them in the fly pen. This makes them more secure of themselves. When it comes to cleaning the cages, breeders may do so after every 15 days. As for cleaning the drinking and eating pots, owners may do so after every week. With a lot of things to remember, breeders definitely have serious responsibilities when it comes to fancy pigeon breeds systems. Nice Blog Thank you for Sharing information about poultry cages. For more Indian Type Poultry Cages in India visit Vijay Raj Poultry Cages .